I am guessing most, if not all, of you know what Mario Kart is already. But just in case you don’t! It is a series of go kart racing style video game made by Nintendo as a spin off of the Super Mario series. The first one came out in 1992, so if you are an 80’s baby like me you would most likely have played it during your youth. Driving through the streets of Tokyo at night with all the lights streaming passed you felt like you had entered another dimension. 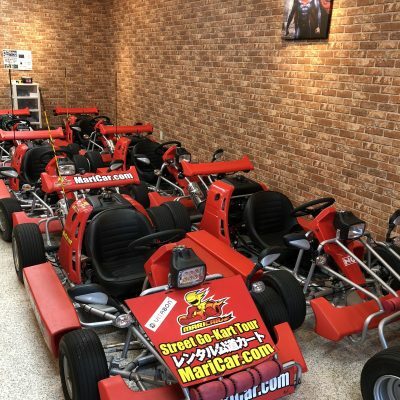 If you think a normal go kart is fast, just wait until you are on one that goes 60-70 mph and weaves in between free flowing traffic. Not to mention the traffic lights, pedestrian crossings and streams of tourists – who turn in to temporary paparazzi upon seeing a group of Mario Karts! Many of the reviews on their website say that the customers felt like celebrities and I can see why. There is no need to be concerned though about your ability to drive them. Once they are in ‘drive’ no more gears are needed and you simply have to focus on go, stop and turning corners. Yes they even have indicators! How does that relate to Tokyo? Well, Japan is obviously the home of Nintendo and anime. Their whole culture thrives on it. You will even see 50 year old men in suits on their way home from work playing anime games on the metro! 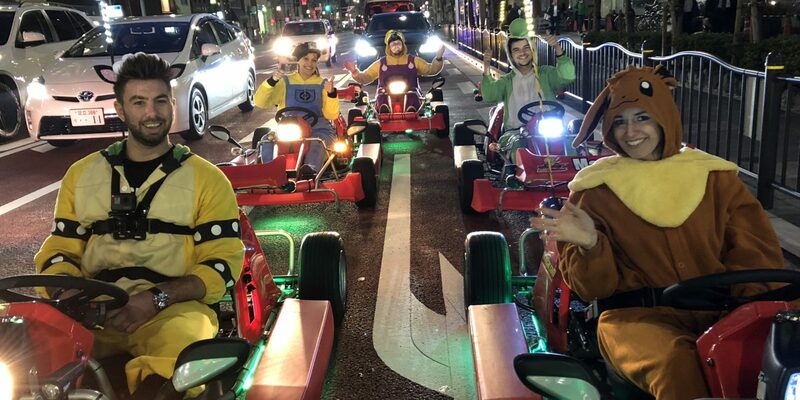 So what could be better than real life Mario Kart, in the home of Nintendo, while dressed as an anime character of your choice!? We were very late making a reservation so couldn’t get spaces at the first office we tried, however they manage to squeeze us in on that same evening at a much smaller office down the road (Akihabara 2). After signing in, we trawled through their boxes & racks of costumes to pick our favourites. There was a short briefing and we headed straight out, following the guide, through the streets of Tokyo. Our main destination was Tokyo Bay but we got to see plenty on the way. About 30 mins in we stopped at Tokyo Skytree to stretch our legs before heading back through Asakusa to Akihabara. I have to admit I was sceptical initially if it would be worth the money (~£33 each for 1 hour). However, the second we drove out of the garage and in to the city lights I was addicted. 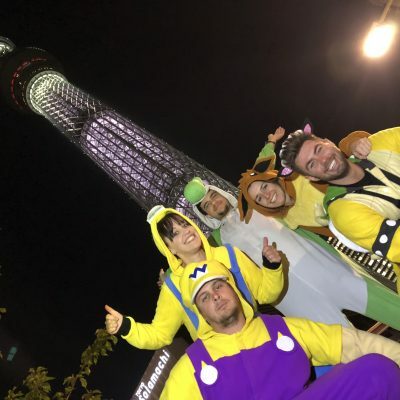 This is a truly unique experience to Japan and one not to miss! It is probably one of the most hilarious thing you will ever do! 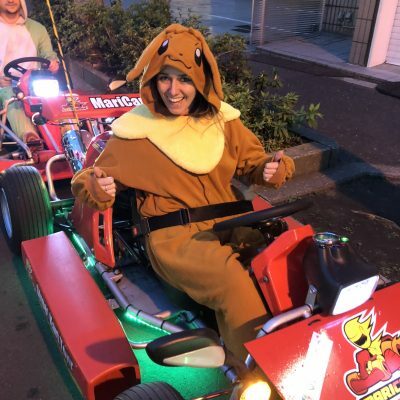 Let’s face it, Tokyo is probably the only major city in the world where you could drive on the roads in a go kart without fearing for your life. There are a number of different tours you can choose from. They last anywhere from 1-3 hours. There are also a number of different stores which offer slightly different tours to each other and also different prices. Akihabara #1 shop prices on its website are around 30% more expensive than we paid at Akihabara #2 store. Their website says you can book on Facebook Messenger or ‘Line’ app. We tried to book via Facebook Messenger but our message was not answered. As we were running out of time in Tokyo we walked in to a store to book direct. NOTE: You need an international driving permit to be able to participate in any of the tours! It is easy to get a permit, we got ours at the post office at Heathrow Airport on our way out. It cost £5.50 and was very easy. Make sure you take a passport photo with you for the application form. If you are heading to Japan soon check out ‘Read this before travelling to Japan’. Join the newsletter to receive updates in your inbox. © 2017 – Travel Creative. All Rights Reserved.